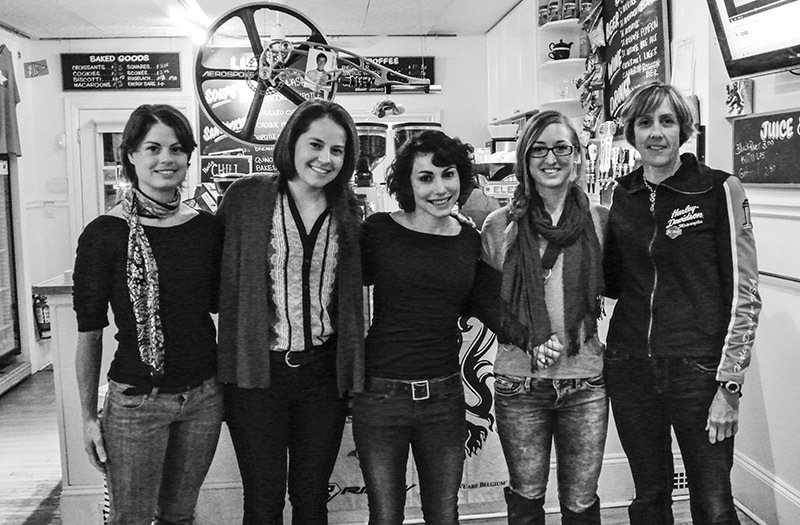 On Thursday night (October 9th) in Dundas ON at Cafe Domestique a group of 25 women settled in to listen to a talk about women's issues in cycling. This was NOT the typical talk about women's issues: lack of: support for women's cycling, of races, income, respect, etc. No, this talk was about "seating" issues, ie: that sitting on a bike should NOT hurt and it it does, here is why and what can be done about it. Molly Hurford, who describes herself as a passionate cyclist who is also a writer, recently wrote a book called 'Saddle, Sore', a small book devoted to women's issues; specifically where a woman's crotch connects to her bike. Instead of shying away from the many conundrums women face on this subject, Molly decided that the subject needed further investigation and spoke to a considerable number of women, or rather they opened up to her about their problems, of which there are MANY. What she discovered is that a lot of (most) women were suffering in silence. Many seemed to think that they were the only ones having this specific problem. Most had never spoken to her doctor or gynecologist about these issues, but felt free to describe, in great detail, to Molly, their problem(s). Cycling became a larger part of her life, while the boyfriend moved on. The learning curve of the right clothing, shoes, bikes, etc., took a while and was often hit and miss. 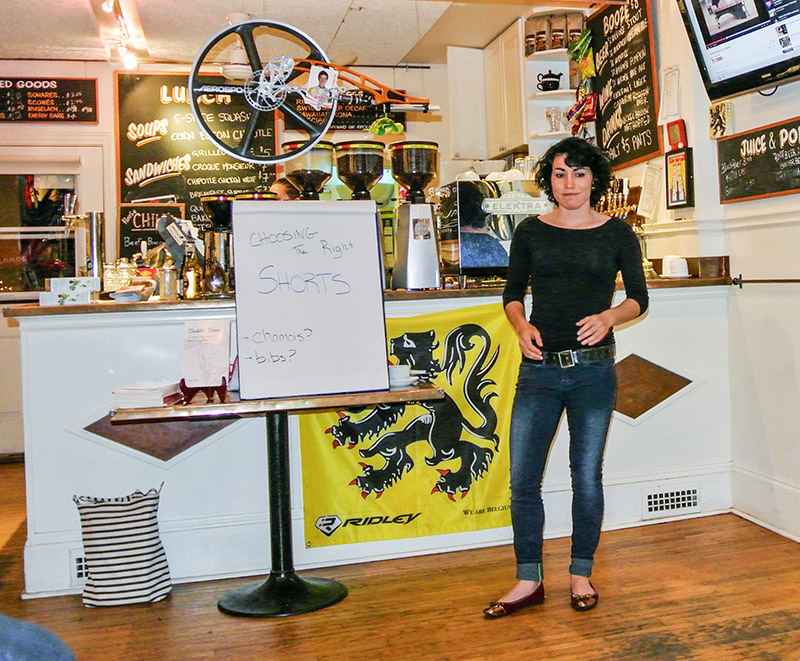 The sheer choices for shorts, saddles, bikes and bike fit can be daunting and there is no one size fits all, she explained. A saddle that works for me, may not for you and the same with shorts, saddle positions, and on and on. There is no quick fix, and 'try, try again' seems to be the best piece of advice.. BUT, once you find what works for you? Stick with it! Molly's style is relaxed and low key and her discussion of more intimate issues, such as chaffing, sores, numbness, shaving "down there", rolls along with the audience not feeling uncomfortable or talked down to. One aside of note. Molly did observe that women were too trusting of what others said worked for them, and less willing to do their own research or make changes, thus leading to further complications. Also in attendance were four other speakers - Annie Forman-Mackie, Carrie Cartmill, Leah Kirchmann and Sue Palmer-Komar who gave short personal talks on why and how they started cycling, what cycling and their success and failures in the sport has meant to their lives and each gave small pieces of advice for aspiring athletes. On a personal note, I have been a cyclist for more than 30 years with 10+ years in cycling retail. I've spent a lot of time working with my female customers to find THE saddle, shorts and bike fit that worked for them. It can be a long process for many and some just give up. What Molly says is good information. Women can spend much time feeling alone with these issues and getting to the bottom (sorry for the pun) of the problem can take a lot of time, energy and money, and the frustration can turn women away from the sport. Cycling should not hurt. If it does, there is something wrong. "Saddle, Sore" goes a long way in assisting women discover what is wrong and how to make their cycling experience more enjoyable.